InfoPlease for research using free encyclopedias, dictionaries, atlases, thesauri, timelines, and much more! CyberSleuth Kids Created for K-12 students to search core subjects and other topics such as web design, animations, fun and art. World Library connects libraries from around the world! World Cat will search all libraries near you for a text you are looking for! Discover dozens of genres representing hundreds of titles, authors, subjects, characters, locations and more ranked by popularity in the world's libraries. Awesome Stories is a Primary Resource with stories, videos, lesson plans (and more) of actual events in History, core subjects, and other topics. Detailed and easy steps to writing a research paper from Cambridge School! 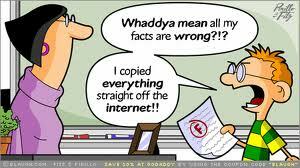 Click here for a video explaining why and how to avoid plagiarism. Use the links below for a few sites that help you correctly cite the information in your papers.